Since temperature affects the measuring accuracy of a pressure sensor, there always remains a small temperature error in the rated temperature range despite a wide range of compensation measures. This error is often expressed in the data sheets of manufacturers of pressure sensors as temperature coefficient (abbr. TC). This coefficient describes a (linear) error, starting from a reference point, which in most cases is room temperature. 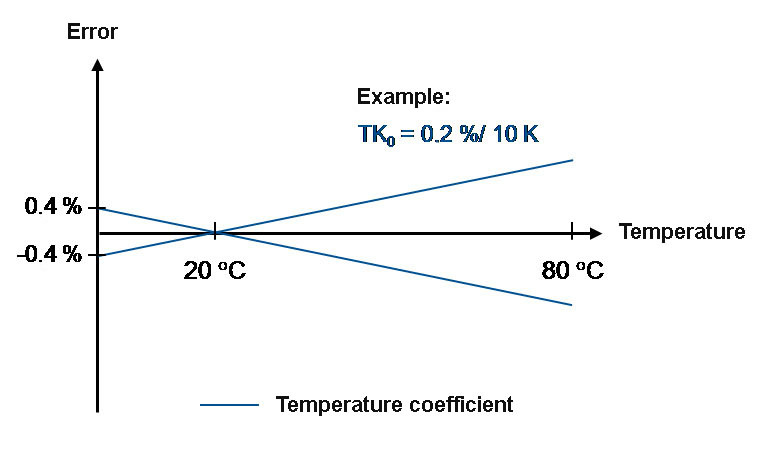 Accordingly, the temperature error at room temperature is zero and increases with increasing difference of the temperature from room temperature with the specified coefficient in linear fashion (see figure). Basically, not only the zero-point temperature coefficient (abbr. TC0), but also that of the span (TCC) must be taken into account individually. The zero-point error describes the effect of temperature on the zero signal. The error of the span specifies the effect of temperature on the full scale value. The individual temperature coefficients of zero point and of span are usually specified as magnitudes, meaning that they can be either positive or negative. If in an individual instrument the zero-point error has the same sign as the error of the span, these two temperature errors may add up in worst case. A typical value for the average zero-point temperature coefficient of a pressure sensor is: 0.2 % / 10 K. Link to WIKA pressure sensors.